My posts have gotten fewer and farther between but I noticed a spike in views of Xeriscape Plant Profile: Rock Soapwort so I'm finally adding to what I'd planned as a series on xeric bee plants. 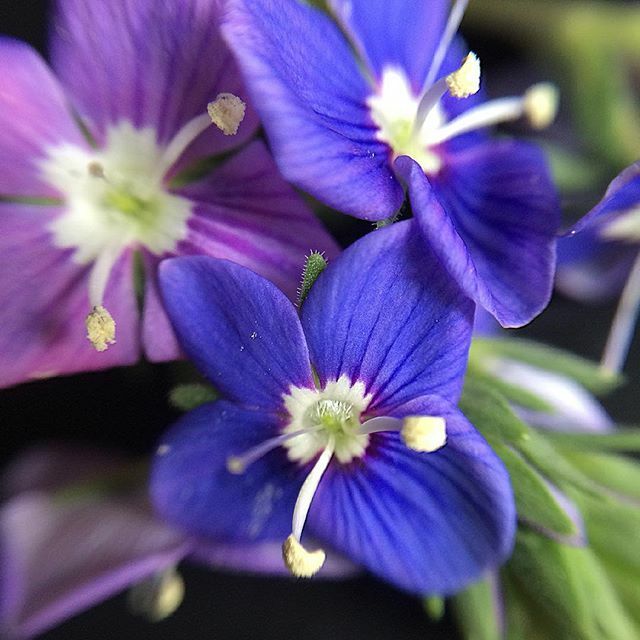 Armenian Speedwell is a little-known species of speedwell. 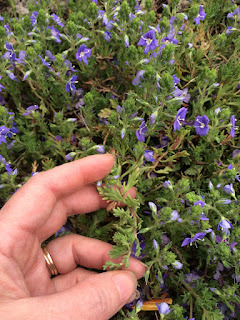 I received mine as a seller's alternate from High Country Gardens, and for many years had no idea what it was other than a veronica of some sort. Veronica armena forms a low, thick carpet of soft lobed leaves, and its bright blue flowers are some of the earliest in my garden every year. Honeybees will take nectar from it but I've only ever seen native bees gathering its pollen. If snow storms haven't destroyed the blossoms, spring trees such as crabapples (also quite xeric) provide more abundant food, so honeybee sightings on V. armena (or even dandelions) are infrequent, making this ground cover perfect for edging walkways (i.e. : there's no fear of a bee flying up your pant leg). 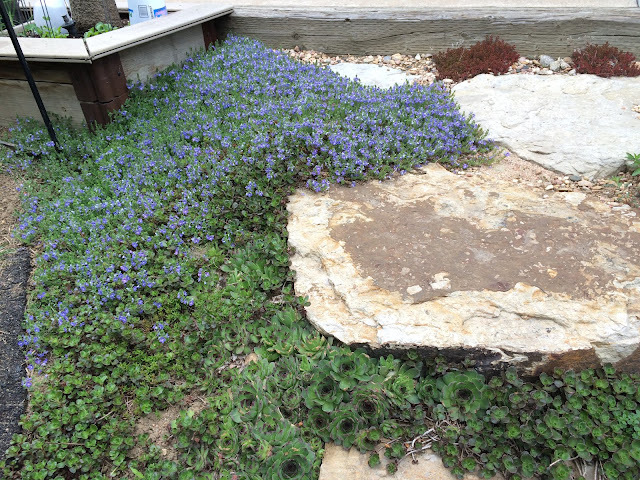 Looking a little blue on a rare overcast day, Armenian Speedwell dukes it out with Dragon's Blood sedum and hens-'n-chicks among the stone steps on a south slope. It doesn't get any more challenging than this! Extremely drought tolerant, this evergreen creeper grows happily with gravel mulch, between flagstones, on level or sloped ground, all without a care. After its profuse 3-week long bloom period in May, I like to deadhead it to tidy things up but it's not necessary. I often see birds picking at the spent flower stems, looking for nesting material. 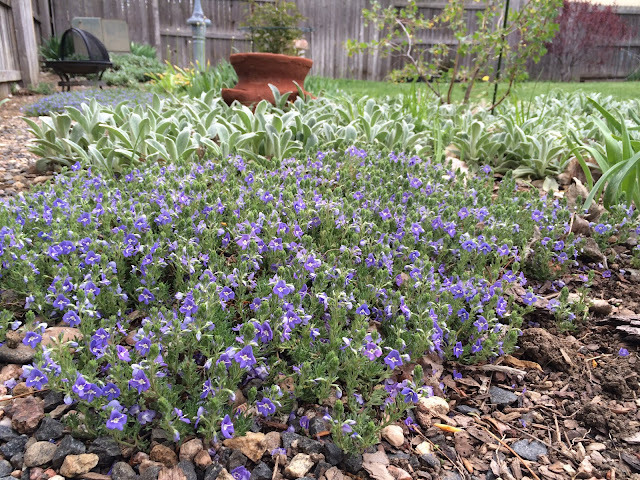 A cool blue companion for Stachys byzantina. What a gorgeous purple carpet! 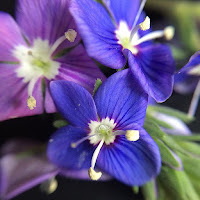 I have some kind of speedwell, which I love, but it goes largely unnoticed by pollinators. Will see if I can find this Armenian speedwell. Thanks for the recommendation!